The imported Viburnum Leaf Beetle (VLB), a native of both Europe and Asia, was first spotted in North America in 1978, in the Ottawa-Hull region of Canada. 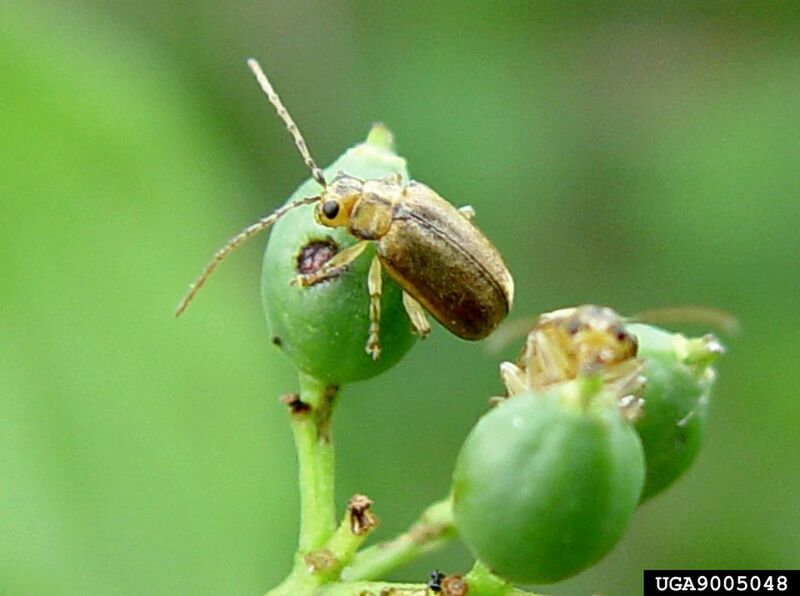 Since then, it has been making its way south from Canada into the U.S. Viburnums have always been considered pest free landscape plants, but this new pest is challenging that assumption. The VLB is a close relative of the more common elm leaf beetle and can very quickly strip the leaves from viburnums plants. Both the larva and the adult beetle feed on viburnum leaves, skeletonizing them in a relatively short time. Initial infestations will not kill the plants, but defoliation for 2 - 3 consecutive years can be fatal. What Does the Viburnum Leaf Beetle Look Like? Viburnum leaf beetles are rather bland looking for an exotic pest and can be easily missed. The adults are about a 1/4 inch long (4.5 to 6.5 mm) and a dull brown, as are the tiny eggs. The larvae are a greenish-yellow, somewhat blending in with the foliage. They grow to about 1/2 inch long. Invasive.org has some great pictures of the various stages of the viburnum leaf beetle, which will help with identification. Does the Viburnum Leaf Beetle Feed On All types of Viburnum? The beetles overwinter as eggs deposited in the branches. They hatch in May, and the larvae then feeds on the new leaves. Since the newly emerged larvae are so small, the first signs of injury may be missed, as the damage can appear as holes no larger than pin holes. Within a month, skeletonizing will be hard to miss. It takes about 8-10 weeks for the VLB to go from egg to adult. Sometime in June, the larvae will make their way to the ground, where they will pupate in the soil. The adult VLB emerges in the latter part of July and continues feeding on viburnums. The female VLB can lay eggs from late summer to the first frost, sometimes as many as 500 eggs per season. She chews holes in the new growth of viburnum and lays eggs in each hole. The holes are then covered with a mix of chewed twig and excrement, making them harder to notice. However, the holes will be formed in a straight line on the underside of the twig. Cornell’s VLB Citizen Science lists those most resistant and varieties to avoid or monitor closely. If you already have viburnums in your landscape, keep a close watch. In the early spring, before the eggs hatch in May, carefully examine the small twigs from the previous year’s growth for egg laying holes and scars. Warmer temperatures will cause the holes to swell, and the caps may fall off. You will need to prune out and destroy all infested wood before the eggs hatch. The new leaves begin to open, check both sides of the leaves for larvae and again prune and destroy infested plant parts. Chemical pesticides are most effective when applied while the larvae are young. Adults tend to fly away or drop to the ground when disturbed. Check with your local Extension Service for recommended pesticides.